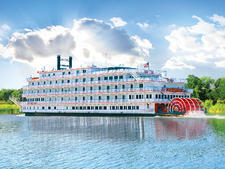 With a growing fleet of coastal cruise and river ships sailing exclusively in domestic waters, it's a given that American Cruise Lines attracts a solidly red-white-and-blue clientele, though a trickle of Europeans and Australians are beginning to join them. 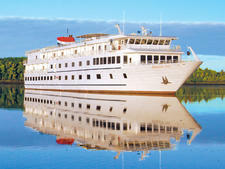 Its 10th vessel, American Constitution, debuted in April with three 10-night Chesapeake Bay sailings centered on an American Revolution theme. 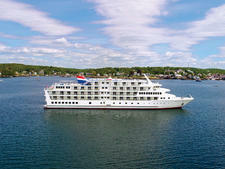 The ship heads for New England in late May, where it'll sail three different itineraries. From late September to late October, it'll take in fall foliage along the Hudson River. 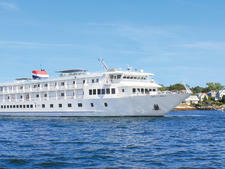 From October to December, it returns to the Chesapeake Bay for several sailings. Like its sister ship, American Constellation, which debuted in 2017, Constitution's interiors have a distinctly Florida vibe. A pale palette of corals, teals and greens; comfy white wicker-style chairs and sofas in the lounges; and blond-wood furnishings in the cabins, evoke a summer beach house ambiance. The young staff is friendly and eager to please, but has more enthusiasm than experience. 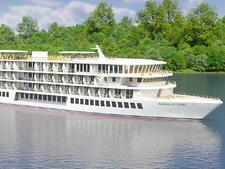 Plus, the hustling crew is pressed into multiple roles, so the server passing a tray of bacon-wrapped scallops at the nightly cocktail hour might also be your cabin attendant. The bartender might be a cruise director better versed in coordinating land transportation than in pouring the perfect martini. And so on. We were on the second sailing of Constitution's American Revolution cruise and, as with most new ships and itineraries, it wasn't without hiccups. For instance, instructions varied on where to pickup a ship-provided free shuttle from Washington, D.C.'s, new District Wharf to the National Mall. (We never did locate it.) At dinner, requests for water refills sometimes went unheeded as servers appeared to wrangle with weightier issues, like what meal belonged where. At one point, the kitchen ran out of milk. But the staffs' we-aim-to-please attitude helps to overcome shortcomings. Case in point: In a mid-cruise survey, a repeat ACL customer noted the dearth of diet soft drinks in the ship's two lounges. The next day, the desk in her cabin was laden with multiple varieties of diet drinks. Baby boomers and their elders constitute the majority faction on this ship. And it's no wonder the line attracts a mature crowd. The staff is solicitous of customers with mobility issues. Elevators reach all areas but the uppermost Sun Deck. All meals are served in the dining room, so there's no juggling trays from the buffet. Some passengers like the convenience of being able to hop in the car and drive or fly a few hours to a domestic port. Our fellow passengers were solidly American with good representation from California, Texas and New Jersey. More than a few mentioned a reluctance to travel overseas in politically turbulent times. And many simply wanted to see a part of America they weren't familiar with. The line's advice for onboard attire is the ubiquitous "casual resort attire." The important thing to know: There's never a need to dress up. In fact, it wasn't unusual to see shorts and cropped pants in the dining room, even at dinner. In the evening, many passengers slip into something slightly dressier, but if you want to wear jeans, you won't feel underdressed. Dress in layers and bring a windbreaker/rain jacket. From the Chesapeake Bay to New England, East Coast weather can be fickle at any time of year. Tips to onboard staff are included. 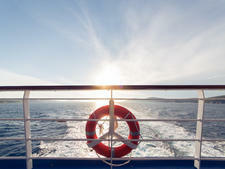 Tips to guides and drivers on shore excursions are at your discretion. You'll get unlimited soft drinks, juices, tea and coffee (including espresso/cappuccino drinks in the two lounges, though they never seemed to work during our cruise). Gratis wine and beer are offered at lunch and dinner. Plus, there's a nightly cocktail hour with a full bar stocked with premium brands (Maker's Mark bourbon, Tanqueray gin) in both the Chesapeake and Sky lounges. 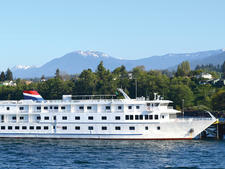 The house wines include multiple varietals in labels that changed throughout the cruise. They're not top-shelf, but they are free-flowing. Beer selections include some local microbrews. After dinner, the Chesapeake Lounge bar re-opens during the evening program, supplementing alcohol with ice cream treats like root beer floats. Passengers booked in suites get soft drinks, juices, wine and bottled water delivered to their rooms daily. 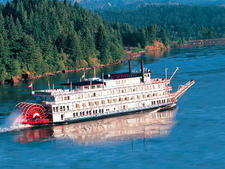 Of 25 shore excursions offered on our sailing, 11 were gratis. The remaining 14 carried a charge ranging from $15 for transportation to Colonial Williamsburg, to $65 for an excursion to the Wright Brothers National Memorial on North Carolina's Outer Banks. 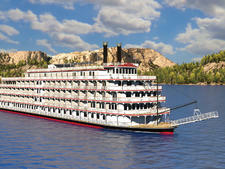 Members of the line's loyalty program, the Eagle Society, get all shore excursions for free beginning with their fourth sailing. Free postcards are available from the main desk. They'll even stamp them and mail them for you. A limited number of umbrellas are for loan. Wheelchairs, walkers and shower chairs also are available for loan, by pre-arrangement. Onboard currency is the U.S. dollar. 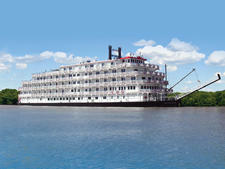 Accounts can be settled by credit card or in cash at the end of the cruise.